Public speaking class demystifies the process of delivering great presentations. 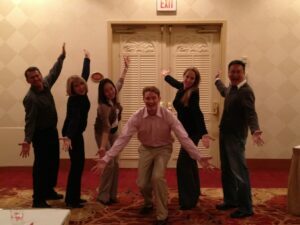 In a recent public speaking class in Las Vegas, Nevada, participants learned a number of simple techniques to make their presentations enjoyable and captivating for their audience. Public speaking training is often skipped over in college curricula, apart from specific majors that require a number of presentations. In most cases, individuals in the workplace are expected to deliver presentations and deliver them well with little to no training. If presenters show signs of nervousness, their credibility is often questioned by an audience. In this particular class, participants were able to see the difference between how they perceive themselves to be when they present, versus how they actually are through the use of videotape. We tend to be our own worst critics, so it's a huge confidence booster when people realize that there's a lot they are doing right in a presentation, not just things that could be improved. With a trained coach and specific tools to work with, this two-day class allows participants to both believe in themselves and improve the quality of their presentations. Fearless Presentations® comes to Las Vegas, Nevada twice annually, and is open to both local participants and those traveling in from other cities. This public speaking class is an excellent way to improve presentation skills. Chris McNeany is a Vice President and Instructor for the Fearless Presentations® course. He is based in Los Angeles, California, but he teaches classes in San Diego, San Francisco, Las Vegas, and Seattle as well.